Sri Lanka Army spokesman Brigadier Udaya Nanayakkara said that the search operations in the high security areas of the Yala Wild life Park are continuing today. A soldier who was injured in a clash with the Tamil Tiger rebels was airlifted this morning for treatment, said the Army spokesman. 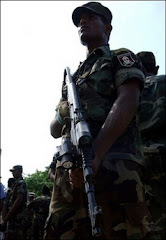 Four LTTE cadres and one soldier were injured in a clash that took place at Debaraduwa around 30 kilometers away from Yala Wildlife Park when Army Commandos confronted a group of LTTE cadres hidden there around 5 PM yesterday. Meanwhile, the remains believed to be of three cattle herders that disappeared on October 18 were found near a reservoir in Tissamaharama area today. Police sources said that the relatives of the disappeared persons have identified the clothes found with the skeletons.